Oh yes! v Isfahan, Írán: Zarezervujte nyní! Oh yes! 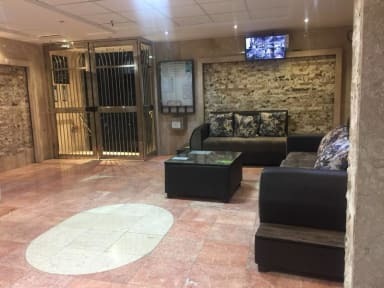 is a spacious and comfortable accommodation close to Kaveh bus terminal where you will arrive from other cities. Also the apartment is located near the highway so the traffic jam will be skipped for most locations. 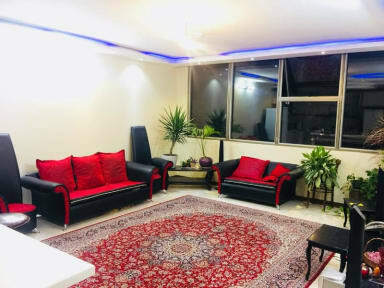 We are located in a nice and quiet neighborhood close to Kaveh bus terminal. You can even walk from the bus terminal to the apartment which takes around 20 minuets. Big supermarket nearby and a 15-minuet drive to the city center. We offer lovely private accommodation. Nice kitchen for cooking and relaxing and peaceful neighborhood. The apartment is equipped with all the necessary stuff such as WiFi, washing machine, TV, sofa,AC ,kitchenware, terrace with BBQ, hot shower, towels, hairdryer, foot massage machine, satellite TV, breakfast with tea and coffee.